OK, it is likely that none of us can lead an absolutely perfect worship service, but I am confident that we can get close to or approach perfection in the way we lead our worship. It starts with having your heart and the hearts of your worship team right with God. But there are also some positive thing you can do to help make your worship service powerful and close to perfect. And we recognise that worship might look different for different churches, but that does not mean that we should not aim for being perfect! So if you are a worship leader, and if you want to increase your skills and start to lead a church service that affects the lives of those listening and singing, then this is a great podcast for you to tune into! As a worship leader for many years, I can tell you that there is nothing quite like leading a service where the Holy Spirit takes off and draws people to the throne of God in an incredible and supernatural way. It is one of the great thrills of serving the King, and if we can learn how to lead services like this, not only will we feel fulfilled but people will flock to be a part of it! Leading worship is a journey for us, and discussions like this can lead us deeper into the Lord, and deeper into our skillset as a worship leader. So guys, do not miss this podcast, even if you think (and you are right) that our feeble efforts could never produce the perfect article in our worship. If we can become closer to perfection in our worship leading, it is definitely worth the journey! Check it out now! I love leading praise and worship! As a musician and a singer, nothing else fills me with such joy and blessing like leading praise and worship, whether it be in a big church or small, or to conservatives or charismatics. I just love what the Lord has called me to do, and long to do it all with all my heart. Yet when you lead praise and worship week after week, month after month and year after year, there is a tendency to get into a rut. A rut is just a grave with the ends knocked out, so it is not where you want to be, that’s for sure! But if you do it for a long time, like a straight stretch of road the challenges disappear and you become professional and all business. You lose the excitement, and very often lose the joy and the power of leading praise and worship. Now, this article has a few ideas that can help you retain your love of your ministry as you worship lead, but our complete training is the best way to really discover how to supercharge your leading of praise and worship in a way that will thrill your church. Check it all out here... Worship leaders usually face a long road, taking on the task for years. You get good at what you do, you begin to feel comfortable and in a real sense you tend to rely on your own strengths and talent rather than on God. You say you are reliant on Him, but the reality is you are good enough to not feel the need to! How can you retain the excitement, joy and glory of God When you are leading praise and worship for a long time? Find different ways to do songs: I try to never quite sing a song the same way, yet I have been involved with worship teams that do it identically week after week for years! Make it different each time, and make it your own! Don’t just reproduce the CD, but take little chances, mix up the order of verses and choruses, go up a key or try a variation like drums only. These little changes make leading praise and worship special and unique each and every service. Go acoustic: every now and then, make your entire worship service completely different. Work on vocals: There are hundreds of variations in harmonies and backing vocals you can explore which can make every song a wonderful, new experience. Allow time for God to move: Praise and worship leading is all about pointing people to the Lord, so don’t script everything so tightly that He has no room to do something extraordinary. Try leaving long periods of silence, or mood music and wait on the Lord. This worship leader podcast is about getting the best sound mixing and control for your worship team. So often getting reasonable sound is a battle between the band and the sound person, but life does not have to be that stressful! You should be on the same team, guys! If this sounds like sound advice, then click below and listen to the sound of the worship leader podcast! The Best Sound Mixing Advice is Just a Pod Away! So in this episode the team take on the whole scary area of getting the best sound mixing during your worship service... How to do it and how to control those who do it in a loving yet firm way. You'll learn a few tricks that most of your sound guys probably don't even know, and by the end of the podcast you will have access not only to the best sound mixing but also to a closer and more productive worship team. So, don't settle for horrible sound, which can ruin your worship service (and believe me, it REALLY can!). Take control today so you can get not only the best sound mixing, but also the best out of your sound team! Sounds like sound advice to me! And, as Always, Don’t just stop with this best sound mixing podcast, check out the Free Ebooks with Worship Leader Podcast Tips! Remember, check the ebooks out and we will give you, entirely free of charge, some of our training books. In fact, if you look at the menu above, one of our training books is devoted to helping you get best sound mixing results! So if you are beginning as a worship leader, start your journey with us. And if you are experienced, but still eager to learn some sensible worship leader tips,join us as well and keep learning. All of us need to keep learning and growing our skills, so it doesn't matter if you are accomplished or not, in a small or large church, between the podcasts, the ebooks, the blog and the forum, there is going to be something for you here at WorshipLeaderOnline.com. Now, to hear the latest Worship Leader Podcast, click on on the hyperlink and turn up your computer speakers (preferably really LOUD!). You can also download the worship leader podcast for free from itunes, or subscribe to it so you don’t miss any episode ever! So driving to work, mowing the lawn or just chilling out, let the worship leader podcast teach you and maximise the use of the time you have for the Lord! Or, if you are really keen, check out the total list of Worship Leader Podcasts, so you can listen to all of them!!! If you want to learn powerful worship leader tips, getting advice from experienced worship leaders could make all the difference in your presentation and effectiveness. The problem is that many experienced leaders closely guard the worship leader tips that have made them successful, meaning that new leaders are often left struggling to find their way in their role, dealing with not only Sunday morning’s worship service but also with the intricacies of song arrangement, band dynamics and musical ideas. Like most professions, there is an easy and a hard way to obtain the information you desire to improve your abilities. One costs a small amount of money and the other is totally free,, and as you grow older and gain experience you begin to recognize that it is most often worth paying a small amount of money for something that helps you learn information quickly and effectively. The hard way is also the “free” way, but unlike the freeway you drive on it is not the fastest way to learn. It involves you spending hours and hours surfing the internet trying to find free information that is exactly what you need to lead worship more successfully. If your time is worth anything, this is the hardest and least effective way to glean worship leader tips. However, many people cannot afford to pay money to streamline their learning experience. That is why we offer free worship leader tips in the form of some great ebooks, and also have a blog and a crazy but information filled podcast! By listening and reading you can begin to gather worship leader tips, but it is not in any particular order or set up in a way that will help you to start applying the information. For a small outlay you can take the easy way of learning worship leader tips, which comes in a succinct, easy to understand and very easy to apply form. This means that you do not need to spend hours and hours scouring the internet to obtain choice worship leader tips from people who have been leading worship for decades, in churches and at huge meetings all around the world. The information is readily available and easy to understand and apply, meaning that you should see an improvement in your worship leading ability within a few days. It also is usually extremely comprehensive, coving everything from band and team member management, song arrangements, song selections, sound, guitars, drums rosters, relationships to the pastor and a whole host of other areas that can make you into a world class worship leader! The best and most effective worship leader tips are those that you can apply immediately, starting this Sunday. This means that you do not need to spend hours researching, studying and trying to find some cool idea. You can read one or two chapters and apply them at the first opportunity. As you continue to apply this information you will see your worship leading transformed and you will become more and more effective for the Lord in your role. So, if you are looking for an improvement in your worship leading keep your mind open to investing in your future, because with the right worship leader tips you can become a fantastic leader in your church! [wp-backlink-search] I recently received an outline of standards for leading praise and worship , and I have asked Jane Sheneman, a worship leader who is going through a torrid time at the moment in her worship team. It seems that Jane believes in standards of excellence, but many of her team do not want to "commit" to these ideals. Goal: To bring "GOD" glory, and people closer to Him through our worship service. Responsibilities: 1. A good testimony to the body (the church family). Cheerful . . . considerate . . .caring (not proud or boastful). 2. Praise Team members are the most visible leadership of the Worship Ministry. 3. A cooperative spirit within Praise Team. Attitude is more important than ability. There is no "I" in Team, but there is "US" in Jesus 4. Give of time to prepare and rehearse music outside rehearsals. You will be expected to listen to & learn the music on the CD provided. 5.Lead in worship. don't hesitate , that only brings confusion. You as leaders need to initiate singing, clapping and the lifting of hands( if appropriate) 6. Team members need to make worship and practice a priority in their lives. Dress: o LADIES: Slacks/Skirts/Dresses – Well below the knee! o MEN: No shorts, t-shirts, or flip-flops. Praise Teams rehearsal : Thursday 6:00-8 in the sanctuary: * Attendance and punctuality are very important factors for being a member of the music team(s). Rehearsals are only 2 hours per week, & 1/2 hour Sunday before Sunday School, That is SO little for such important work. Two things are required for every rehearsal: 1.Great Attitude! 2.ON TIME Arrival! *Make a habit that on time is 5-10 minutes early! In case you must be absent . . . you need to call or text "Jane Sheneman" as soon as you know you can not be there. If I am unavailable "leave a message on cell(1XXXXXX) or home(XXXXXXX) phone" I will get back to you as soon as possible. * Rehearsals are required, and members should arrive ready to work on the designated material. Poor attendance and punctuality reflect a lack of discipline and respect for the Lord's ministry. *a continued inability to be @ practice or arrive ontime means you will not be prepared & unable to lead with team in Sundays a.m. service. *Ministery often involves a sacrifice - this often expresses itself in a time commitment. A Lifestyle that is continually growing to conform to the image of Christ. * Participants must be born-again believers of Christ, and their lifestyle must resemble that of a born-again Christian. If there are problems along the moral line I will talk to the individual in question. If there is no improvement that person may need to talk with the pastor. *Because the Praise Team is a position of leadership an unwilling desire to adhere to church policy may result in being asked to step down. each case will be handled tactfully and confidentially with the aim of restoring your faith and ministry potential, keeping your confidence in the leadership of this ministry and the congregation. Teachable: This means No one has ever "arrived" - be open to one another and new ways of looking at things and correction. receive constructive criticism and be open to the comments and ideas of others. Humility is a virtue and James 4:6 says: But he gives more grace. Therefore it says, “God opposes the proud, but gives grace to the humble.” also Luke 14:11 says: For everyone who exalts himself will be humbled, and he who humbles himself will be exalted.” hum·ble 1.not proud or arrogant; modest: to be humble although successful. *any differences need to be dealt with in Love and seek to foster peace ( James 3:17) always build each other up with positive comments and affirmities. We need to strive as a "Team" to sacrifice our own wants and desires to see the greater good for the group and the church. realizing we are interdependant of each other and valueing what each of us brings to this ministry, welcoming and giving everyone a sense of belonging, and being considerate of each other. Philippians 2:1 -4 Imitating Christ’s Humility 1 Therefore if you have any encouragement from being united with Christ, if any comfort from his love, if any common sharing in the Spirit, if any tenderness and compassion, 2 then make my joy complete by being like-minded, having the same love, being one in spirit and of one mind. 3 Do nothing out of selfish ambition or vain conceit. Rather, in humility value others above yourselves, 4 not looking to your own interests but each of you to the interests of the others. Commited to Excellence: We should never " wing it" or "fly by the seat of our pants"! in any ministry and this should be reflected in our worship with careful planning, practicing and execution. This does not mean "professionalism" and we are not here to entertain people but we need to do our best and bring God the glory through our ministry. We should never be content with where we are at but always seek to become better at what we do and serve GOD with excellence. Prepare your heart to Worship Sunday morning we are often so rushed and harried that we are not in an attitude of worship. We need to take time as a team before we warm up to quiet our hearts, pray and ask the Lord to be in and with us throughout the service. Leading people in worship is a privilege and responsibility,you will be leading people toward the throne of God. Unity and a love for one another will effect our ability to do this. *Please note: These guidelines are meant to help us as a Team to grow towards Christ and each other, also to help us in our decisions and priorities. All who are interested in being a part of the Praise Team(s) will be required to sign a statement form which would be a mutual agreement between both parties. So what do you think? If you are leading praise and worship regularly in your church you may find this information very helpful!Worship training should be an essential part of preparation for the worship leader. I have had thousands of people attend my training seminars across the world and the feedback is that they have gained valuable insights from the worship training which they would not have discovered by themselves. Every now and then I meet someone who says, “I don’t need praise and worship training, I will just follow the Holy Spirit!” The question is, would the Holy Spirit ever lead you to get training in your gift, and would such training ever become a valuable asset for you and your church? There is no denying that praise and worship leading is a gift. We can clearly see that some people have it, and others do not, and it is not whether the person can sing or play that determines it. Some people sing beautifully but when they try to lead the worship service falls flat! It’s a gift, sure, but can this gift be improved in any way? I believe that, whatever your level of gifting, the right type of worship training will enhance the gift on your life. You will pick up ideas and techniques which can only add a new and fresh element to your praise and worship leading and make you a better praise and worship leader. It is the same principle that applies to a musician, or a football player. However naturally gifted you might be, going to practice will make you a better musician or footballer. You will learn new techniques, ideas, skills and be able to perform to a higher level. Why should these same principles not apply to praise and worship leading? I have been leading worship for many years, and I teach on the subject all around the world, yet I am still learning! Frankly, I haven’t arrived yet, and if you are honest, neither have you! I am always keen to learn more and improve my craft, and I believe that worship training keeps you sharp and helps you to continue to grow in your skills and abilities to become all that you can possibly become in the Lord. At very least worship training will challenge you with new ideas and concepts. It will cause you to examine how you lead and maybe modify what you are doing. Those who decide that they do not need any worship training but only need the Holy Spirit are missing out, and they are misunderstanding the work of the Spirit in their lives. God uses anointed, experienced worship leaders to train others, just as He uses preachers and teachers to train others in the Body of Christ! The whole purpose of worship training is to improve your worship leading ability and make you the very best leader that you can possibly be! So whether you are average or awesome, experienced or untried, you will never lose round but will always gain when you pursue worship training!Here is worship leading podcast number 4 and today in the worship leading podcast, we are going to look at the whole concept of talking during your worship leading. As I travel across the world, I see worship leaders talking far too much as they lead and actually becoming a distraction to the congregation, detracting from the worship service rather than adding to it! So how do we find the right amount of talking to include in our worship leading? List to the pod and find out! Click on the button below to download it now. So Come and Check Out Our Worship Leading Podcast! The purpose of today's worship leading podcast is not simply to offer worship leading tips, but we have loads of fun and share experiences as we do this. I am joined on today's pod by the whole gang, and I am sure that you will get something out of it. You should find plenty to laugh about as well as worship leading podcast tips that you can apply straight away, starting this Sunday. Also remember that we offer free e-books at this website, and one of them deals directly with the question of leading worship in small groups. So if you are starting out and eager to learn some practical worship leading tips, between the pod and the free books you are sure to pick up information that will make you a better worship leader, starting next Sunday. If you haven't got your free books yet, click the link below. And feel free to leave comments or to e-mail us because we want to enjoy the journey together with you. I'm sure that many of you have worship leading tips that you can share with others as well, so leaving comments on the blog will be there for everyone to read and be blessed. To start the podcast, click on the link at the bottom of this page and let me know what you think! So God bless and I look forward to sharing these worship leading podcast and tips with you in the coming weeks and months as well. If you want to learn how to lead praise and worship that flows there are some things that you can do to encourage this. One of the most common problems I see in many worship leaders is that the service does not flow naturally and gently from song to song, either because of the church service format all because of the leaders in experience. One of the most significant barriers to learning how to lead can be the church service structure. Many churches see the music as punctuation around the other areas of the service, so the church service program allows only one or two songs to be sung in a sequence before the flow is broken up by other activities, such as announcements, the offering, prayer, missionary spots, and so on. If you want to learn effective worship leading that really flows, the first step is to approach the pastor about the format of the meeting. Ask him if he would mind combining all of the above listed activities into one particular place in the service, allowing you to run three or four songs together in worship. This simple change in format can change the way you lead praise and worship very significantly. One of the key elements in learning how to effectively lead praise and worship lies in song selection. If you select songs in a similar key, or songs that are easily able to be blended together, then you will be going a long way towards a worship service which flows naturally from song to song. This can transform your church because they would no longer be singing a selection of songs that they will be able to flow from song to song and enjoy an entire worship experience. Learning how to do this effectively is one of the great keys in learning how to lead praise and worship in an anointed way. One of the most frequent problems I see with inexperienced leaders who are learning is that they speak too much. If it is not going well they speak to the audience, in telling them to get involved or praying with them. Please do not misunderstand, I am not saying it is wrong to speak during the worship service. However, my experience is that as you grow in your ministry you will also learn how to keep quiet and let God draw people's hearts into the service, not your words. This allows people to concentrate on the world and not on your thoughts, prayers or opinions. Most of the truly great worship times I have ever experienced, with myself or someone else leading, have involved little or no talking between songs. There is much more to learn about how to lead praise and worship effectively, but these three points can start you getting the right direction. When you are leading praise and worship one of the key questions you face, indeed one of the greatest sources of criticism for worship leaders in general, is how long the worship time should go for? A second and related question is, “How long should you leave people standing? ", which will be deal with in another post. 1. Start on time when leading praise and worship: Regardless of how many or how few are in the room, START ON TIME. This may not be applicable in some 3rd world situations when people travel hours on foot to be there, but for the rest of us, let's get it right and start on time. It is not a performance, and you are doing this as unto the Lord, so it should make little difference how many are in the room. To start late and then encroach on the pastor's sermon time is an affront to the pastor. 2. Be prepared to reduce the length of the worship time. You are there to be a servant, not a star, so always be the first to volunteer to cut back. If something else goes overtime, you should volunteer to reduce what you are doing. When I lead worship at Bill Newman meetings, if time is tight I am always the first to volunteer to cut back, because that’s what real servants do! And, at least half the time, Bill kindly refuses the offer and asks me to sing my full quota of songs. You see, there is a blessing in serving a Man of God! 3. Have a couple of songs up your sleeve: It is often a good idea to have a couple of songs in reserve, just in case you need them. So, when you choose the songs for the service, you don’t have to play them all! 4. Don't get locked into a program when leading praise and worship Be flexible enough to change songs, cut songs or even add songs if the Spirit permits. I am always wary of the printed orders of service. Sometimes they are timed, which is even scarier! Now, I know we need some sort of order of service, and that everything needs to be done in order, but let's not sacrifice the move of the Spirit on the altar of an orderly programme! If something happens, we need to be free to change. 5. When do you stop the worship? I always tell the pastor, "Please come up on to stage at any time for any reason and feel free to take over." I am subject to the pastor, so whenever he is good and ready (or if he feels things have changed) he needs to feel free to stand up and join us in worship or take over. Again, it is all about being a servant, not having your own way! 6. Ask yourself, "How many times do we need to do this song?" One of the most frequent criticisms of worship leaders is that they repeat songs or sections of songs to the point of frustration. It is a song of worship, guys, not a mantra! So, when preparing for a service, consider these ideas and be sensitive both to the Spirit and also to those in the congregation. You are called to lead worship, not perform and not torture. In the end less is usually more when it comes to leading praise and worship. I love leading praise and worship! As a musician and a singer, nothing else fills me with such joy and blessing like leading praise and worship, whether it be in a big church or small, or to conservatives or charismatics. I just love what the Lord has called me to do, and long to do it all with all my heart. Yet when you lead praise and worship week after week, month after month and year after year, there is a tendency to get into a rut. A rut is just a grave with the ends knocked out, so it is not where you want to be, that’s for sure! But if you do it for a long time, like a straight stretch of road the challenges disappear and you become professional and all business. You lose the excitement, and very often lose the joy and the power of leading praise and worship. Worship leaders usually face a long road, taking on the task for years. You get good at what you do, you begin to feel comfortable and in a real sense you tend to rely on your own strengths and talent rather than on God. You say you are reliant on Him, but the reality is you are good enough to not feel the need to! Whatever method you favour, make sure that you keep things fresh and totally to God’s glory when you are next leading praise and worship! So in this episode the team take on the whole scary area of getting the best sound mixing during your worship service… How to do it and how to control those who do it in a loving yet firm way. You’ll learn a few tricks that most of your sound guys probably don’t even know, and by the end of the podcast you will have access not only to the best sound mixing but also to a closer and more productive worship team. So, don’t settle for horrible sound, which can ruin your worship service (and believe me, it REALLY can!). Take control today so you can get not only the best sound mixing, but also the best out of your sound team! Sounds like sound advice to me! Remember, check the ebooks out and we will give you, entirely free of charge, some of our training books. In fact, if you look at the menu above, one of our training books is devoted to helping you get best sound mixing results! So if you are beginning as a worship leader, start your journey with us. And if you are experienced, but still eager to learn some sensible worship leader tips,join us as well and keep learning. All of us need to keep learning and growing our skills, so it doesn’t matter if you are accomplished or not, in a small or large church, between the podcasts, the ebooks, the blog and the forum, there is going to be something for you here at WorshipLeaderOnline.com. Now, to hear the latest Worship Leader Podcast, click on on the hyperlink and turn up your computer speakers (preferably really LOUD!). You can also download the worship leader podcast for free from itunes, or subscribe to it so you don’t miss any episode ever! So driving to work, mowing the lawn or just chilling out, let the worship leader podcast teach you and maximise the use of the time you have for the Lord! Like most professions, there is an easy and a hard way to obtain the information you desire to improve your abilities. One costs a small amount of money and the other is totally free,, and as you grow older and gain experience you begin to recognize that it is most often worth paying a small amount of money for something that helps you learn information quickly and effectively. The hard way is also the “free” way, but unlike the freeway you drive on it is not the fastest way to learn. It involves you spending hours and hours surfing the internet trying to find free information that is exactly what you need to lead worship more successfully. If your time is worth anything, this is the hardest and least effective way to glean worship leader tips. However, many people cannot afford to pay money to streamline their learning experience. That is why we offer free worship leader tips in the form of some great ebooks, and also have a blog and a crazy but information filled podcast! By listening and reading you can begin to gather worship leader tips, but it is not in any particular order or set up in a way that will help you to start applying the information. For a small outlay you can take the easy way of learning worship leader tips, which comes in a succinct, easy to understand and very easy to apply form. This means that you do not need to spend hours and hours scouring the internet to obtain choice worship leader tips from people who have been leading worship for decades, in churches and at huge meetings all around the world. The information is readily available and easy to understand and apply, meaning that you should see an improvement in your worship leading ability within a few days. It also is usually extremely comprehensive, coving everything from band and team member management, song arrangements, song selections, sound, guitars, drums rosters, relationships to the pastor and a whole host of other areas that can make you into a world class worship leader! The best and most effective worship leader tips are those that you can apply immediately, starting this Sunday. This means that you do not need to spend hours researching, studying and trying to find some cool idea. You can read one or two chapters and apply them at the first opportunity. As you continue to apply this information you will see your worship leading transformed and you will become more and more effective for the Lord in your role. So, if you are looking for an improvement in your worship leading keep your mind open to investing in your future, because with the right worship leader tips you can become a fantastic leader in your church! Worship training should be an essential part of preparation for the worship leader. I have had thousands of people attend my training seminars across the world and the feedback is that they have gained valuable insights from the worship training which they would not have discovered by themselves. Every now and then I meet someone who says, “I don’t need praise and worship training, I will just follow the Holy Spirit!” The question is, would the Holy Spirit ever lead you to get training in your gift, and would such training ever become a valuable asset for you and your church? There is no denying that praise and worship leading is a gift. We can clearly see that some people have it, and others do not, and it is not whether the person can sing or play that determines it. Some people sing beautifully but when they try to lead the worship service falls flat! It’s a gift, sure, but can this gift be improved in any way? I believe that, whatever your level of gifting, the right type of worship training will enhance the gift on your life. You will pick up ideas and techniques which can only add a new and fresh element to your praise and worship leading and make you a better praise and worship leader. It is the same principle that applies to a musician, or a football player. However naturally gifted you might be, going to practice will make you a better musician or footballer. You will learn new techniques, ideas, skills and be able to perform to a higher level. Why should these same principles not apply to praise and worship leading? I have been leading worship for many years, and I teach on the subject all around the world, yet I am still learning! Frankly, I haven’t arrived yet, and if you are honest, neither have you! I am always keen to learn more and improve my craft, and I believe that worship training keeps you sharp and helps you to continue to grow in your skills and abilities to become all that you can possibly become in the Lord. At very least worship training will challenge you with new ideas and concepts. It will cause you to examine how you lead and maybe modify what you are doing. Those who decide that they do not need any worship training but only need the Holy Spirit are missing out, and they are misunderstanding the work of the Spirit in their lives. God uses anointed, experienced worship leaders to train others, just as He uses preachers and teachers to train others in the Body of Christ! The whole purpose of worship training is to improve your worship leading ability and make you the very best leader that you can possibly be! So whether you are average or awesome, experienced or untried, you will never lose round but will always gain when you pursue worship training! Here is worship leading podcast number 4 and today in the worship leading podcast, we are going to look at the whole concept of talking during your worship leading. As I travel across the world, I see worship leaders talking far too much as they lead and actually becoming a distraction to the congregation, detracting from the worship service rather than adding to it! So how do we find the right amount of talking to include in our worship leading? List to the pod and find out! Click on the button below to download it now. The purpose of today’s worship leading podcast is not simply to offer worship leading tips, but we have loads of fun and share experiences as we do this. I am joined on today’s pod by the whole gang, and I am sure that you will get something out of it. You should find plenty to laugh about as well as worship leading podcast tips that you can apply straight away, starting this Sunday. Also remember that we offer free e-books at this website, and one of them deals directly with the question of leading worship in small groups. So if you are starting out and eager to learn some practical worship leading tips, between the pod and the free books you are sure to pick up information that will make you a better worship leader, starting next Sunday. If you haven’t got your free books yet, click the link below. And feel free to leave comments or to e-mail us because we want to enjoy the journey together with you. I’m sure that many of you have worship leading tips that you can share with others as well, so leaving comments on the blog will be there for everyone to read and be blessed. One of the most significant barriers to learning how to lead can be the church service structure. Many churches see the music as punctuation around the other areas of the service, so the church service program allows only one or two songs to be sung in a sequence before the flow is broken up by other activities, such as announcements, the offering, prayer, missionary spots, and so on. If you want to learn effective worship leading that really flows, the first step is to approach the pastor about the format of the meeting. Ask him if he would mind combining all of the above listed activities into one particular place in the service, allowing you to run three or four songs together in worship. This simple change in format can change the way you lead praise and worship very significantly. One of the most frequent problems I see with inexperienced leaders who are learning is that they speak too much. If it is not going well they speak to the audience, in telling them to get involved or praying with them. Please do not misunderstand, I am not saying it is wrong to speak during the worship service. However, my experience is that as you grow in your ministry you will also learn how to keep quiet and let God draw people’s hearts into the service, not your words. This allows people to concentrate on the world and not on your thoughts, prayers or opinions. Most of the truly great worship times I have ever experienced, with myself or someone else leading, have involved little or no talking between songs. There is much more to learn about how to lead praise and worship effectively, but these three points can start you getting the right direction. 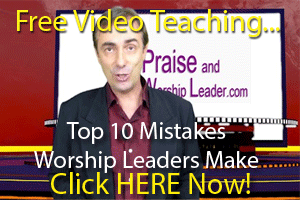 How Long Should You Be Leading Praise and Worship For? When you are leading praise and worship one of the key questions you face, indeed one of the greatest sources of criticism for worship leaders in general, is how long the worship time should go for? A second and related question is, “How long should you leave people standing?”, which will be deal with in another post. The first thing to point out is that those of us who are leading praise and worship come from a different perspective to most of the congregation, and also the pastor. We love to worship, it is our passion and that’s why we became worship leaders in the first place, so as far as we are concerned, long worship times are just fine. However, not all the people in church share our enthusiasm or passion for leading praise and worship, so for many of them the worship time is the preliminary act to the main show, which is the preaching. Most pastors feel this way too, because to their perspective, the preaching is the main part of the service. When you are called to leading praise and worship you may think that your most important role is to lead people into worship. That’s not strictly true: it is your main role, but it is not the most important role! The most important role is to serve, the Lord, the pastor and the congregation. So, as a general principle, if a large number of your congregation, and your pastor think the worship service was too long, then it probably was! While we all want to be flexible enough to allow the Lord to work in our church service, we cannot escape the fact that everyone has an opinion as to how long a worship service should be. Be aware that those leading praise and worship and musicians will always think it needs to be longer, while many of the congregation believe it ought to be shorter. Most churches I visit have very long worship times, which resemble endurance tests or in some cases even torture as people are made to stand with their hands in the air for hours. To sit during one of these sessions seems to convey either weakness of lack of spirituality! The reality is it probably conveys cramps and commonsense. Any fool could see that this is not appropriate, but apparently not some worship leaders, who continue to drag out worship times to the max. I once ministered at Hills Christian Life Center, the Mecca for Aussie musicians (do we all face Hills when we pray? ), and saw Darlene lead worship. It lasted 20-25 minutes. Shock, amazement! They were straight into the Lord’s presence from the first song, and they did not labor the worship as some do for over an hour. This should speak volumes to those of us who lead worship. Worship needs to be ENJOYED, not ENDURED! Regardless of how many or how few are in the room, START ON TIME. This may not be applicable in some 3rd world situations when people travel hours on foot to be there, but for the rest of us, let’s get it right and start on time. It is not a performance, and you are doing this as unto the Lord, so it should make little difference how many are in the room. To start late and then encroach on the pastor’s sermon time is an affront to the pastor. 2. Be prepared to reduce the length of the worship time. You are there to be a servant, not a star, so always be the first to volunteer to cut back. If something else goes overtime, you should volunteer to reduce what you are doing. When I lead worship at Bill Newman meetings, if time is tight I am always the first to volunteer to cut back, because that’s what real servants do! And, at least half the time, Bill kindly refuses the offer and asks me to sing my full quota of songs. You see, there is a blessing in serving a Man of God! It is often a good idea to have a couple of songs in reserve, just in case you need them. So, when you choose the songs for the service, you don’t have to play them all! Be flexible enough to change songs, cut songs or even add songs if the Spirit permits. I am always wary of the printed orders of service. Sometimes they are timed, which is even scarier! Now, I know we need some sort of order of service, and that everything needs to be done in order, but let’s not sacrifice the move of the Spirit on the altar of an orderly programme! If something happens, we need to be free to change. 5. When do you stop the worship? I always tell the pastor, “Please come up on to stage at any time for any reason and feel free to take over.” I am subject to the pastor, so whenever he is good and ready (or if he feels things have changed) he needs to feel free to stand up and join us in worship or take over. Again, it is all about being a servant, not having your own way! One of the most frequent criticisms of worship leaders is that they repeat songs or sections of songs to the point of frustration. It is a song of worship, guys, not a mantra! So, when preparing for a service, consider these ideas and be sensitive both to the Spirit and also to those in the congregation. You are called to lead worship, not perform and not torture. In the end less is usually more when it comes to leading praise and worship.